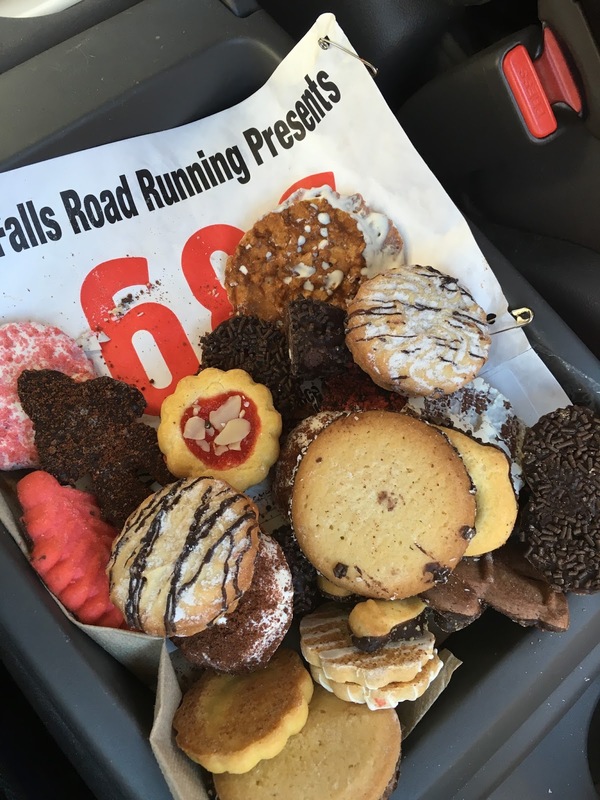 In December, my husband and I ran the Celtic Solstice 5 mile and while the course was wonderful and the weather was wonderful and even my time was wonderful, what was really wonderful was the incredible COOKIE TABLE. There was also delicious soup and mulled wine and hot coffee and a sweet Irish band and lots of cool gear for sale, but my favorite part of the race was the cookie table. The race was at Druid Hill Park, the site of my first triathlon in 13 years. I felt like I had a good vibe on the course because at that triathlon, I actually won the Novice Females group. Won it. Overall. That was a pretty amazing feeling. It was about as amazing as enjoying that cookie table. I knew I'd have a decent flat section as we circumnavigated the reservoir. But the reservoir was only part of the course. The rest was supposedly up and down hills. My coach prepared me for this event with some serious hill workouts and they paid off because I honestly felt like I was flying up every hill. The race starts with a short but serious hill. Of course you can cruise down that hill to the finish. Luckily, right after you finish you can head to the tent with the cookie table. While I was sad that two close friends from college weren't able to join me for the race I did see people I knew. As I did some warm-up strides before the race on the first hill I ran into a old college running friend. 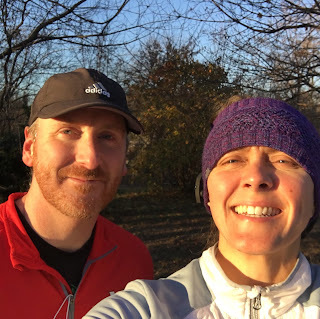 And after the race, I found a high school running friend! Fun times.We chatted together as we ate cookies from the cookie table. Personally, I worried I was a little over-dressed in my cold-killer pants and jacket. I tossed my ear warmer and gloves as we passed my mini-van. But in the long run I'm glad I wore my jacket because I had pockets for keeping my cookies from the cookie table. There were tons of people running in kilts. I did love the guy running in Druidic horns, just like Cernunnos (that prehistoric deity in my short story). Wish I had snapped a photo. Good thing I got a photo of the cookies from the cookie table. From the photos I've seen, this course is often covered in snow. Frankly, we had gorgeous weather and I would definitely do it again. Here's a cool short overview video. And not just for the cookie table although let's be honest, the cookie table is a really, really good reason to run.